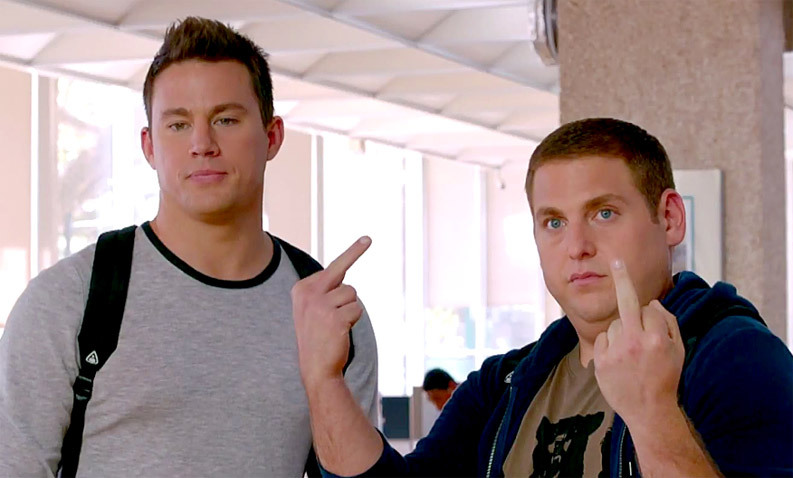 If I told you four years ago that not only would a 21 Jump Street comedy be made, but that Jonah Hill would be involved, and they’d have a sequel called 22 Jump Street, you would have kicked me in the nuts. Then publicly shamed me for being a terrible person. You also may have been slightly confused at the oddly specific-ness of that foretelling. For all intents and purposes, 21 Jump Street should not have done as well as it did. But it ended up being funny, making a lot of money, and here we are. And this time, they don’t care what you think. College! That is where our heroes, Jenko (Channing Tatum) and Schmidt (Jonah Hill) are going. Same aliases. There is a new new drug that has its own list of side effects that killed a girl. So they are going to infiltrate the dealer, find the supplier and take them down. Hmm, same plot too. But this time it is different. Because in College, people can be free thinkers. You also don’t need a hall pass. This time, Jenko is going to try out for football looking for dealers, where he meets the quarterback Zook (Wyatt Russell), who is basically Jenko’s clone and instant best friend. Schmidt is going the art kids route, looking for drama and poetry geeks who might be hitting the WHYPHY up hard. That is where he meets Maya (Amber Stevens) and gets a girlfriend out of it. It isn’t creepy like the last movie, because she is of age. But no! It is not just the same! After all, their bosses are still played by Ice Cube and Nick Offerman. Because that makes sense. But the new thug bad guy is Peter Stormare. That is different. Not to mention we have people from Workaholics, like Jillian Bell and uhh. That might be it. Basically, what is important though is that they have the same blanket set as I do in real life. 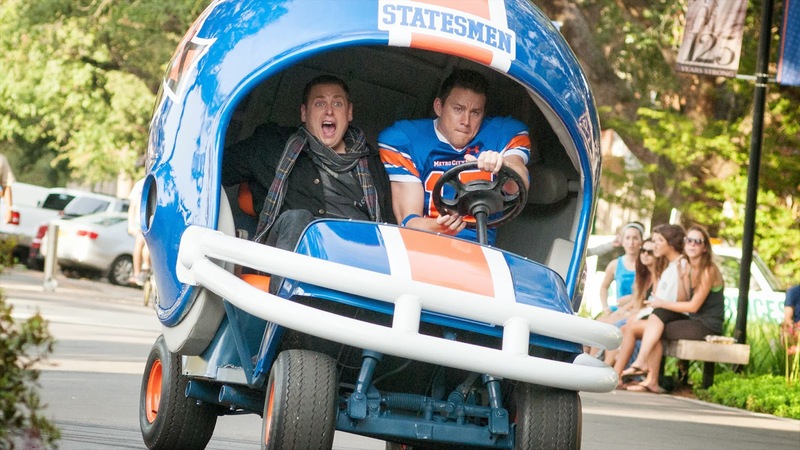 After viewing, I determine that 22 Jump Street was like one very long and elaborate inside joke. That would be annoying normally, but here is the good news. You are in on the joke, too. It all makes sense, because you are a person who saw the first film and understands that everything probably has an extra layer of meaning to it. That’s right. This film is really aware of itself/meta/whatever you want to call it. And it will beat you over head with the jokes and at least for me, it didn’t get stale at all. Not only did it just keep building and building, along with an increase in action, but they didn’t even stop when the movie ended. It had to be one of the more amazing/funny credits I have ever seen. And they didn’t even fill the credits with dumb outtakes or anything. Tatum might just be a comedy guy. Hill’s character had its moments, mostly dealing with one fight scene near the end and his interactions with Ice Cube, but Tatum had so many laugh out loud lines and moments. Only a few were shown in the trailer. The “lightbulb” scene with Tatum might be the funniest thing I have seen in a movie in over a year. Just thinking about it makes me laugh. I feel like I am giving out this rating far too much over the last few weeks, but seriously, movies are really earning their keep this summer. Phil Lord and Christopher Miller are comedy gods and they should be worshiped as such. Man, now I definitely have to go see this.